The C&OHS maintains a collection of historic rolling stock that was originally owned by the C&O Railway. The highlights of the collection include a dining car, combination coach-baggage car, sleeping car, coach, and two cabooses. Other cars include two boxcars and a refrigerator boxcar, all of which are scheduled for restoration. The C&OHS also owns a former Clinchfield Railroad F-7 diesel locomotive which it leases to a tourist railroad operation. 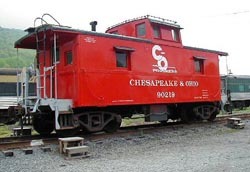 Beginning in 1982 the C&OHS has acquired through purchase or donation several pieces of former C&O railroad equipment. The initial aim was to restore the equipment both aesthetically to a selected period and mechanically so as to be operable on excursion trains. Since that time the excursion train business has essentially evaporated. The second thought was to move the equipment to specific locations to use it for historic interpretation at festivals, fairs, and events. This effort had gotten off to a fairly good start, with some pieces of C&OHS rolling stock having been used at several locations including Lynchburg, VA, St. Louis, MO, Gaithersburg, MD, Alderson, WV, Huntington, WV, Fredericksburg, VA, Hinton, WV, as well as Clifton Forge, VA. Restored cars have been used in Maryland, West Virginia, Virginia, and as far away as Chicago and St. Louis on excursions, in tourist line operations with marked success. The increasing reluctance of railroads to move the equipment, rising cost of movement by freight train, and the increasing lack of available sidings in appropriate locales has essentially ended this process. 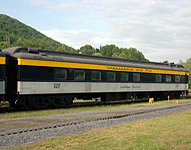 The present intent is to continue restoration of the equipment cosmetically with minimal concern about road-worthiness, so as to use it in a historical interpretive manner at the C&O Heritage Center at Clifton Forge, VA.
Gadsby’s Tavern – C&O dining car built 1922, refurbished for use on The George Washington, C&O’s new premier passenger train in 1932, and in railway use until 1967. COHS has completely restored the car to 1932 appearance outside and in the dining room. 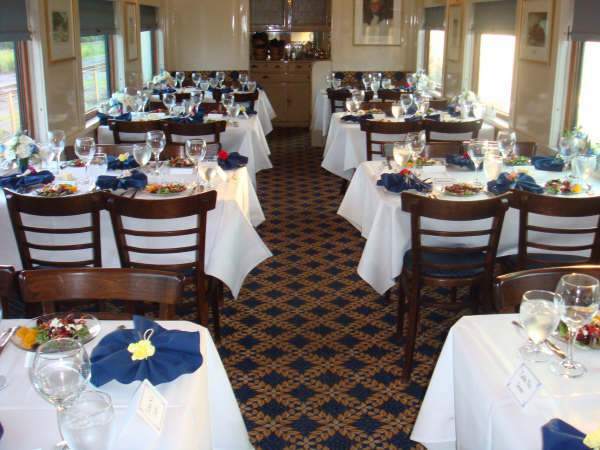 Kitchen is modern, allowing actual operation of the car, which has been used as a stationary interpretive site, and on excursion trains in many locations. C&O #458 – C&O combination car built in 1926, used for many years on Hot Springs Branch (Covington-Hot Springs, VA), in railway service until 1971. Restored to 1950 appearance including functional passenger compartment, and express/mail/baggage display in baggage compartment. Also has modern display cases in baggage compartment for thematic displays. C&O #1658 – C&O lightweight coach from railway’s huge order of 1950. Restored externally to 1950 appearance; inside remains configured as Amtrak used the car in the 1970’s. C&O #3176 – C&O Extended Vision Caboose built 1968. Restored to its as-built appearance inside and out with blue exterior paint of the era. C&O #90219 – C&O Steel Caboose of 1949, restored completely inside to original appearance. Outside to be repainted to original red paint scheme in 2001. Other cars in the collection remain to be restored (complete roster available). Up to date information about the C&O Railway Heritage Center is at CandOheritage.org.